This is a prequel to the Chronicles series, so I don't know why it is referred to as book 4 of that series, which it clearly is not as far as I am concerned. Rather it stands on its own. It is a good story, and I liked the ending. To be up front and honest, this is my genre. Romans, conquest, and drinking. That being said, this isn't a classic...it's the book that classics study and then they feel inadequate. I despise the antagonist and I fear for the protagonist. Is it possible for a book to accomplish more? It's a great prequel, explains some of the things in the earlier books (actual later timeline) that I found interesting. rounds out the character a bit more. it's almost better to read this AFTER you read the Stiger Novels. This author has great talent. Wonderful characters and plots and storylines. Best read I've had in months. I will be buying this authors other works soon. You will not regret the time you spend with this author. Audible tells me that I've listened to over 350 books over the past 12 months, (have optic neuritis), this book stands simply out over 98% of those books. The plot moves, the characters have appeal, the author seeds hints while weaving his tale and making us invested in Stiger. 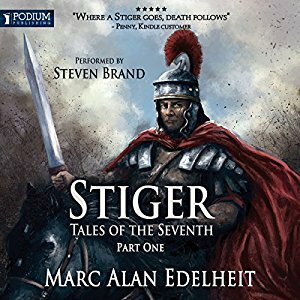 Love the Stiger series! This is the second book I have read of this series. The great description and fine attention to detail makes you feel like you're actually there. I can't recommend these books enough! Keep up the good work Marc! I was debating what to read when I remembered that I had bought this story a while ago but hadn't gotten around to listening to it. I'm glad I remembered. 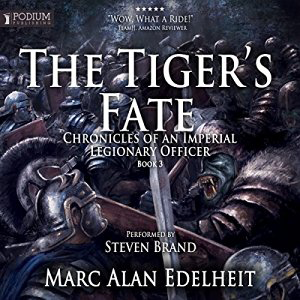 The story follows a young captain set in a Roman imperial type world who is sent south to a new command at the edge of the empire fighting a rebellion. 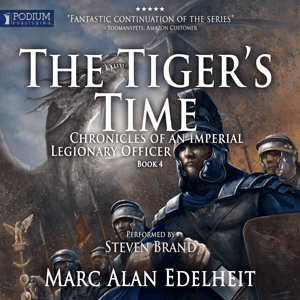 Great new series, combining a fictional Roman war with Fantasy. The first book was good, but a bit slow to develop. The author needed time to develop his characters and kills a few off in the action packed second book. Great new melding of two of my favorite genres. 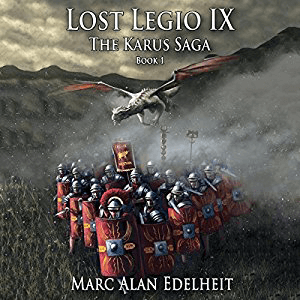 As a big fan of Douglas Jackson's "Hero of Rome" etc and the occasional fantasy romp I was pleased with the detailed look at a new concept.. a Roman legionary surrounded by elves, dwarves, and magic! Really excellent book I can't wait for the next one. Great story I usually don't like magic added in but this was so interesting and very well written. I can't wait to see what is in store for the Tigers. Kudos to the author. 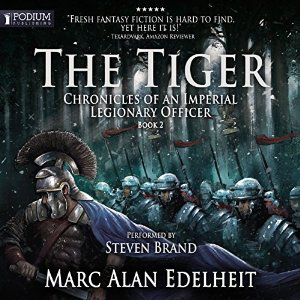 I thoroughly enjoyed this audiobook it was never lagging kept me interested so pleased to have found the series and look forward to the next book again just a wonderful job forgive me for being aggrandizing but this book was excellent. I have found that each book is better than the one before the last. How it is done is a wonderful thing. If you are a fan or history but like a little of the fantasy thrown in than this is the series for you. GREAT READ, THE WHOLE SERIES!!! This book was suspenseful in nature. The ending was something I didn't expect whenever I started it, because it really didn't seem like it would end that way. I also expected Stiger to develop a relationship with the elf, in probably the next book. Truly a great ending. Since this is the 4th book in the series I have to tailor the review with that in mind. To my fellow fans that have read the first 3 I say this....the epic adventure continues and expands in size and scope. This is a terrific instalment in the series. Some of the early scene-setting seemed drawn out but proved important to the narrative. I love the combat scenes & I can't wait for more involvement from the gnomes. This book I have not been able to put down, in the time since I bought the Kindle version, I have spent every available minute reading this book. Amazing book! Cant wait for the next one! This book is full of battles, heartbreak, HUGE armies, and all sorts of dwarf, orc, gnome and yes, even some dragon action. This universe has potential everywhere! 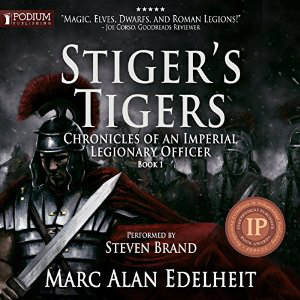 I generally do not like fantasy, but after being accidentally introduced to the Stiger series, I have come to really enjoy the books. Now, Marc Edelheit has presented us with Book 1 of the prequel series and it looks like it is going to be great fun. Another great book from one of my favorite authors. I bought the print and audio versions, and I am happy I purchased both of them. This book is good, because of the fantasy mixed with the mysterious disappearance of the 9th legion. Slow to start because of the background that had to be laid down. But it had to be laid down. I loved it though! Lots of craveable action and leads to a wanting for the next book! Just what I hoped it to be. Excellent characters and story line. Cannot wait to hear book 2.